You can install the case first, screen later. Motor-in-roller assures quiet and smooth operation. Ceiling-recessed screen with automatic closure. 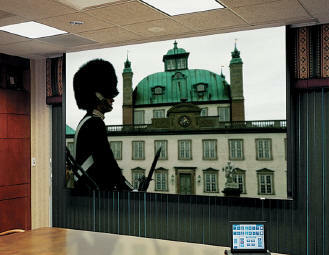 Ceiling-recessed screen that can be installed quickly and easily. No other projection screen offers you the benefits of installing the case during construction, and quick connecting the screen at a later date to eliminate job site damage. It's easy to switch screen surface or format making it less expensive than buying a new screen. The Ultimate Access/Series E has an independently motorized ceiling closure. In its closed position, the motorized closure forms a solid bottom panel giving the ceiling a clean appearance. At the touch of a switch or wireless transmitter, the door of the Ultimate Access opens into the case before the viewing surface descends into the room. Includes a non-tensioned screen surface, sometimes referred to as free hanging or conventional. The Ultimate Access Case may be ordered in advance of the screen or alone.